During the working process of the sand making production line, the large stone material silo is evenly fed into the jaw crusher by the vibrating feeder for coarse crushing. The coarsely crushed stone material is sent to the cone crusher by the belt conveyor for medium crushing. The crushed stone is sent to the vibrating screen by the belt conveyor for screening. The finished sand is sent to the sand washing machine by the belt conveyor and then sent to the finished material pile through the belt conveyor; the large grain stone is sent to the standing by the belt conveyor. 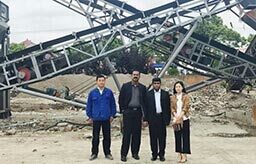 The impact crusher is finely crushed, and the finely crushed stone is again sent to the vibrating screen by the belt conveyor for screening, thus forming a closed circuit for multiple cycles. 1. Full-automatic operation process, higher production efficiency, more optimization of work efficiency, high automation degree, large crushing ratio, high production efficiency, large processing capacity, after crushing products are cubic, needle-like content is low, no internal cracks, high compressive strength. 2. More widely and successfully applied in the crushing of limestone, basalt, granite, cobble and other rocks. 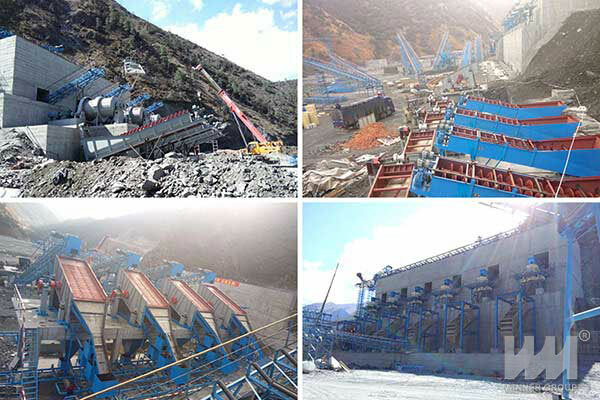 The quality of the crushed products can meet the standards, which provides qualified aggregate for the industries of highway, railway, water conservancy, concrete mixing station and so on. 3. It can be used for aggregate and artificial sand of hard limestone, granite, basalt, river pebble and other materials. It is widely used in hydropower, building materials, highway, urban construction and other industries. According to different process requirements, various types of equipment are combined to meet the different process requirements of customers. Prev Article：How to select the vibrating screen for different materials?